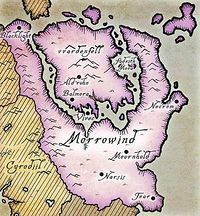 Necrom is one of the eight major city-states of the province of Morrowind, situated along the eastern coast on a peninsula overlooking the Padomaic Ocean. Necrom is known as the City of the Dead, because in Dunmeri tradition, the various families and clans of Morrowind would travel to Necrom, bring their deceased family members in urns and coffins that last for months. Necrom's house affiliation is unknown, but it is generally located around the Indoril District and the Telvanni District. The city-state of Necrom is built on a peninsula that overlooks the Padomaic Ocean, near the island of Gorne. The coastline is known for being treacherous, and it is where the supposed "Bat-Lizards" are located. It is implied that these Bat-Lizards are, in fact, ancestors of the modern-day Cliff Racers, as they no longer exist. These were discovered by Topal the Pilot, an Aldmeri explorer that sailed across the continent of Tamriel. Necrom is a bustling city, ironic since it is the City of the Dead. It is governed by a complex hierarchy of priests and attendants who operate the well-known necropolis in Necrom. Underneath the city is an extensive catacomb, arranged like a honeycomb. This is where the deceased are brought and prepared for burial. Necrom has lofty walls and gleaming white towers. Necrom is neighbored by several settlements, one of them being Sailen Vulgate in the west. Necrom's earliest history is largely unknown, however, it was built in a time before the Tribunal had been established. But as the Tribunal Temple had come forth, Necrom had become a focal point in the Tribunal's traditions. The bones and remains of the dead in Necrom can be interred to the Ghostfence, situated in the distrct of Vvardenfell, but this is reserved for the great heroes and leaders of Morrowind. Remains of the people's clans can be used for a ghost fence for their clan's ancestral tomb. In Tribunal mythology, Necrom was created from the remains of GULGA MOR JIL, the eighth and most powerful monster that Vivec had faced. Both Vivec and Nerevar traveled to the village where Vivec was discovered by Ayem and Seht, it is here that the eighth monster was located. The monster asked Vivec, why he needed to die, and the Warrior-Poet said that it would be a betrayal to nature otherwise. But when that did not satisfy the monster's question, Vivec recited a poem, "The fire is mine: let it consume thee, And make a secret door, At the altar of Padhome, In the House of Boet-hi-Ah, Where we become safe, And looked after." The monster accepted his fate, and so he was killed by Muatra and his bones had become the foundation of Necrom. As time went on, Necrom was fully-established city. Sometime in the Second Era, the young and ambitious, Ayrenn had traveled all across the continent of Tamriel, making a stop in Necrom. Disguising herself as a rather large Dunmer, Ayrenn was successfully able to steal the Indigo Scrolls from the vaults of Necrom. This was one of the many stories she had during this time. During the Imperial Simulacrum in the late Third Era, the city of Necrom was ruled by Queen Hekothah, when the kingdom had a rivalry with Mournhold. This page was last modified on 4 February 2019, at 03:12.